As you may have found out the last time you nailed a really big pothole, wheel alignment is important to the health of your car or truck. Poor road conditions may bump your suspension out of the carefully calculated locations that the components have been set. When tires are misaligned, the vehicle will pull to one side or the other, and you may also notice that the steering wheel is no longer centered. 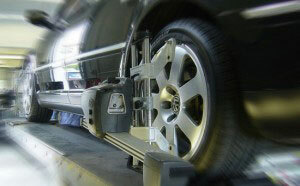 When we place new tires on your vehicle, alignment of your vehicle’s suspension system is required.